Although a number of bacterial viruses contain lipids, probably arranged in a bilayer, the only one which has been investigated systematically and in detail from the structural and biochemical point of view is bacteriophage PM2, which grows on a marine pseudomonad, Pseudomonas BAL-31 (Espejo and Canelo, 1968a, b). 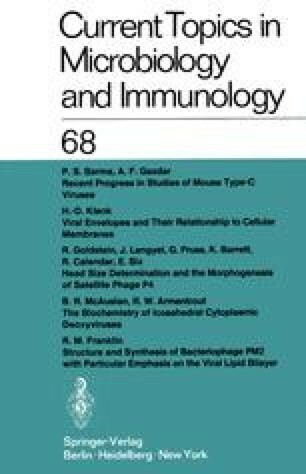 Therefore, the major portion of this review will deal with the molecular biology of bacteriophage PM2. We will commence, however, with a brief review of the other bacteriophages reported to contain lipids and end with a brief comparison between PM2 and other lipid-containing viruses.